Why is product leadership so relevant today? Editor's note: Below is an excerpt from Product Leadership, a book by Richard Banfield, Nate Walkingshaw, and Martin Eriksson. A product leader is ultimately responsible for the success or failure of a product and, by extension, the company itself. The impact of that cannot be underestimated. Norton’s time at GV (previously Google Ventures) convinced him of the importance of product leadership. He believes that product leadership should have a vision for the product and where it should be in a year, in 5 years, and in 10 years from now - and then articulate this vision to the rest of the leadership team and to the wider organization. Creating a product vision and crafting a plan to get there is as relevant as you can get to the organization’s success. As we’ve acknowledged, the CEO analogy is problematic but successful product leaders often look and sound like CEOs. Understanding that product managers are leaders and not just managers is the cornerstone of this book. Forgive us if we repeat this point throughout the book. It’s an idea worth reinforcing. The product team is in the unique position of trying to achieve an outsize impact, while having almost no authority over the teams that build, market, support and sell the product. This is very different from previous generations when the manager held authority over the team and decisions by virtue of the title. That era has passed and a new approach to management has emerged. As Norton says, management is now earned through positive behavior. Product leaders should never assume that their title qualifies them to lead by the inferred authority of the role alone. This cooperation doesn’t happen by accident. Product managers and leaders are expected to take an active role in building culture and leading their teams through the mundane day-to-day activities, not just the high level strategies and vision. As peers to the other departments, “this sets up a healthy tension between engineering, product and marketing, and the different ways those departments think. This is healthy because it allows product management to synthesize all these alternative views into the optimum decision for the product and the company,” continues Norton. Balancing the feedback and friction that comes from other teams and external sources is part of the job. An evolving organization understands that eliminating friction isn’t the mandate, it’s understanding what insights might result from that friction. Maintaining this friction while preventing chaos is something Steve Selzer speaks passionately about. As the Experience Design Manager at AirBnB, he is referring specifically to the friction that results from a poorly designed UX, but his insights are relevant to all aspects of product. As is the case with so many things in product creation, the rules that apply to successful product design also apply to successful product team leadership. Without a team the role of the product leader would not exist. The successful leader is reflected in the success of their team, and likewise, a poor leader is revealed by the failures of their team . It has been suggested that if product leaders were paid by the effectiveness of their teams we’d have more successful products. How the team is recruited, developed and guided is probably one of the most important elements of the product leader’s role. It is also, without doubt the hardest part of the job. Product leaders have more relevance because they are increasingly the people responsible for connecting the dots between the executive vision and the practical work on the ground. Bryan Dunn, Senior Director of Product Management at Localytics talks about the early days at his company. A product leader needs to balance the triumvirate of viability, feasibility and usability. To do this, they look to the executive to handle the viability aspect and then translate that into what’s feasible and usable. The CEO should be setting the general direction for the company. For some early stage companies, the CEO will also be occupied with raising money, adding senior team members and a dozen other things. Dunn’s observation shows that it is often the people closest to the customer who are best-suited to make product decisions. This fact means that product leaders are also best-suited to shape the direction of the product. Product leaders have first-hand insight into the customer experience. This insight might not be available or top of mind with all senior executives in the organization. The product leader must have the authority to lead the organization’s product direction. Managing the flow of information and directing the organization as an advocate of the customer are important aspects of being a product managers. Leading the internal team is an essential part of the job. Makers need uninterrupted time to create stuff and solve problems. Some process ceremonies can interfere with this focused time. All managers and leaders should be judged by their team’s outputs, and product leaders are no different. If you’re managing a team of makers, your day will be judged by how well you protected them from distractions and what they were able to make. This dimension further elevates product leaders from old-school management. No longer are they barking orders at subordinates but rather empathetically motivating creative personalities toward mutually rewarding goals. They create safe mental and physical places for makers and problem-solvers to work, and make the team the heroes. This means the leader is also advocate, coach, guide, mentor and cheerleader to the team. 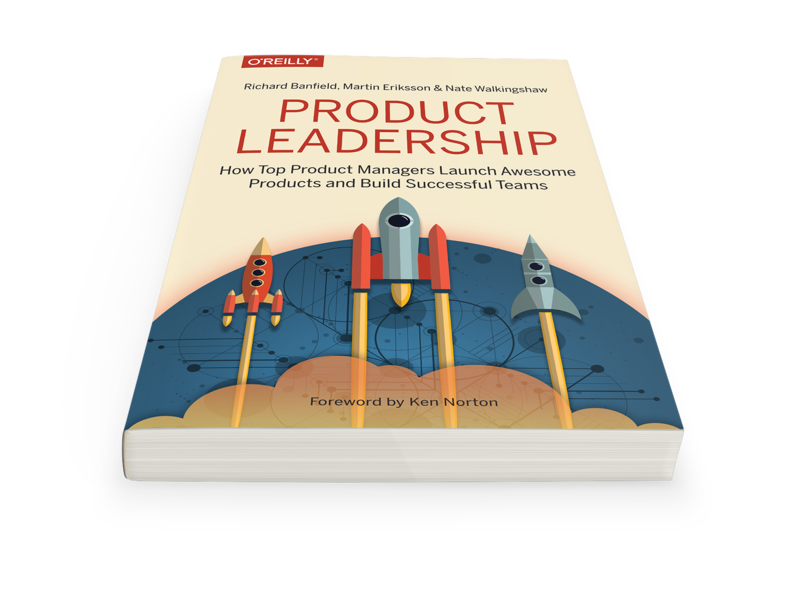 Richard recently published Product Leadership: How Top Product Managers Launch Awesome Products and Build Successful Teams, which he coauthored with Nate Walkingshaw and Martin Eriksson. He also authored Design Leadership and Design Sprint: A Practical Guidebook for Building Great Digital Products, which he coauthored with C. Todd Lombardo and Trace Wax. Richard is the CEO and co-founder of Fresh Tilled Soil, and under his leadership Fresh Tilled Soil has delivered UX and product design to 700+ clients across the world. His colorful life experience includes being an officer in the army and a dive master on the remote Islamic Republic of the Comoros.